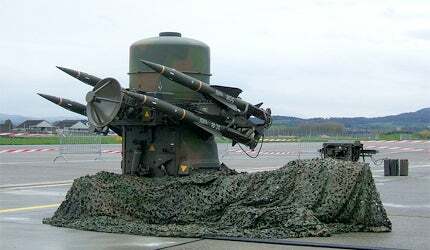 JERNAS is the export name for the Rapier FSC (Field Standard C) air defence system. 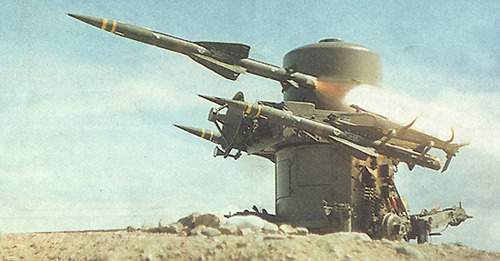 JERNAS is based on the Rapier mk2 missile and launcher. The Rapier FSC / Jernas launcher has eight ready-to-fire missiles and its own electro-optical surveillance and tracking system. The high-resolution radar tracker provides the system with dual engagement capability. Jernas is designed to engage the most demanding threats including multiple stealthy targets aswell as cruise and tactical missiles. Oman, Singapore, Switzerland and Turkey have had their Rapier systems upgraded for the mk2 missile. The Rapier missile is capable of engaging supersonic, low-level, high-manoeuvrability aircraft and can be towed behind medium size vehicles and armoured personnel carriers. It is air-portable by transport aircraft or helicopters. JERNAS is the export name for the Rapier FSC (Field Standard C) air defence system developed by MBDA (formerly Matra BAe Dynamics, UK). JERNAS is based on the Rapier mk2 missile and launcher, which is in service with the British Army and Royal Air Force, the Blindfire tracking radar and the Dagger surveillance radar. JERNAS provides defence against unmanned aerial vehicles, cruise missiles, and fixed and rotary-wing aircraft. Development of the system started in 1992 and 57 Rapier FSC systems were produced for the UK Ministry of Defence. Rapier FSC first entered service in 1996. The systems are operational in two air defence batteries of the Royal Artillery and were operational in four ground-based air defence squadrons of the Royal Air Force. 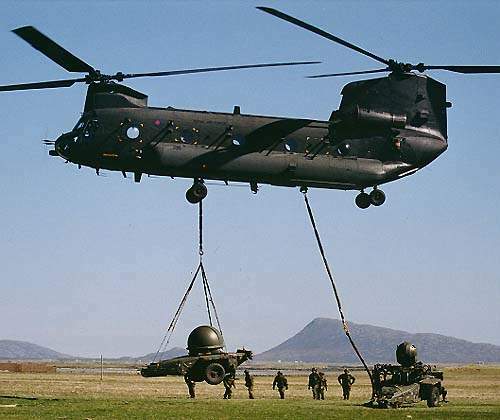 In July 2004, the UK Ministry of Defence announced plans to reduce Rapier anti-aircraft missile launchers from 48 to 24 fire units, including the disbanding of the RAF Ground-Based Air Defence (GBAD) Squadrons. Two RAF GBAD squadrons were disbanded in March 2006 and two were reroled in April 2008. A new Air Defence Command and Control System, ADC4I, is to be developed for the UK Ministry of Defence GBAD programme phase I. The system will integrate Rapier FSC and the Starstreak air defence missile system to provide a network-enabled capability. Phase II will involve the upgrading of the missile systems. MBDA and EADS Defence & Communications were awarded the contract for the assessment phase of the programme in December 2003. Various versions of the Rapier missile system are in service with nine countries. Oman, Singapore, Switzerland and Turkey have had their systems upgraded and have ordered the mk2 missile. The Australian Army withdrew its Rapier systems from service in November 2005. 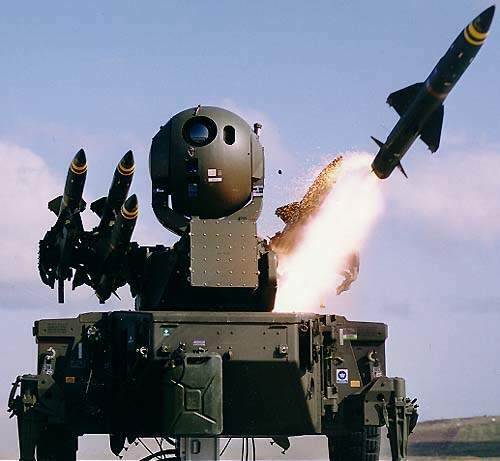 In April 2002, Malaysia signed a contract with MBDA to procure the Jernas system, including nine missile launchers (later increased to 15), three radars, Rapier mk2 missiles, training and support. Malaysia is the first export customer for Jernas. BAE Systems Insyte supplied the Blindfire tracking and weapon control radars and Dagger surveillance radars. The first system was delivered in March 2006 and ten systems were delivered by the end of 2006. The firing unit holds eight ready-to-fire missiles. The missiles are mounted on launcher rails on the walls of a rotatable turret. A full reload is carried out manually in 2mins and requires no lifting aids. "Various versions of the Rapier missile system are in service with nine countries." The Rapier mk2 missile is equipped with a fragmentation high-explosive warhead from BAE Systems Land Systems (RO Defence) and is fitted with a multi-mode laser proximity fuse. The missile’s propulsion system is a two-stage enhanced solid-propellant rocket motor from Roxel (UK Rocket Motors), formerly BAE Systems RO, Rocket Motors Division. The guidance is automatic infrared and radar command to line of sight. The Dagger target acquisition and surveillance radar is a multi-beam high resolution 3D radar supplied by BAE Systems Insyte (formerly Alenia Marconi Systems). The radar is a frequency agile 3D pulse Doppler radar operating in J band, with scan rate of 60rpm or 30rpm. The maximum detection range of the radar is in excess of 15km. An optional range of 32km is available. The maximum elevation is 5km. The system has the processing capacity to detect more than 75 threats a second. The radar provides bearing data and threat assessment from a Cossor Mark 10 or 12 IFF (Identification Friend or Foe) system. The signal processing system incorporates clutter rejection algorithms and is also resistant to electronic countermeasures. A high-elevation guard beam automatically switches off the transmissions when the presence of an anti-radiation missile is detected. 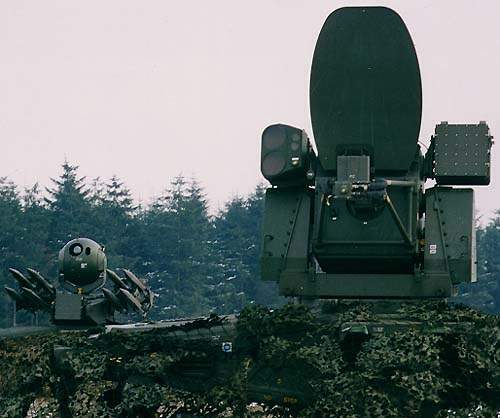 The Blindfire tracking radar, supplied by BAE Systems Insyte, is a differential monopulse frequency agile radar operating at F band which provides fully automatic all-weather engagement to a range of 15km. The output is sufficiently powerful to burn through most jamming signals and the radar uses advanced frequency management techniques to evade jamming and other hostile electronic countermeasures. The system incorporates a self-surveillance reversionary mode of operation. A dedicated missile command link provides dual firing capability. "JERNAS provides defence against unmanned aerial vehicles, cruise missiles, and fixed and rotary-wing aircraft." The electro-optic tracking device, a passive infrared electro-optic sensor, is mounted on the top of the turret in a spherical housing and is controlled by an operator at a weapon control terminal. The tracking device can be used in scanning mode to provide passive target detection and acquisition in radar-silent operations. Raytheon Systems Limited has been awarded a contract to supply all the UK Army’s Rapier FSC systems with the SIFF (Successor Identification Friend or Foe). When the surveillance radar detects and acquires a target, the bearing data is downloaded to the tracking radar and the launcher, which then automatically align to the target bearing. The target is acquired on the optical tracking system. When the surveillance radar has confirmed that the target is hostile the missile is launched. The missile is guided towards the target at speed in excess of Mach 2.5 by passive infrared line of sight and active command to radar line of sight. The automatic reaction time is less than 5s and a second target engagement takes less than 3s.